I did one day of shooting (acting) on the set of the movie Your Right Mind last week. I did a scene with an actor whose face you would recognize even if her name doesn’t ring a bell. After getting up around 4 o’clock for a 5:45 a.m. call, it was just starting to get light and it was bitter cold. Every time the door of the diner where we were shooting opened (which was often) a blast of arctic air hit us. The actor in question was clutching her prop — a pot of hot coffee — to help warm up her bare arms. Although the stereotype of the pampered starlet makes better tabloid headlines, I find this actor’s attitude to be much more representative of most of the professionals — actors and crew alike — who work in the film industry. When you hear all those stories about spoiled Hollywood divas, remember there are a whole lot of real pros out there who are very good at what they do and glad to get a chance to do it. For some reason we don’t hear their stories very often. The actor’s name is Clea DuVall, a class act and a really good actor. 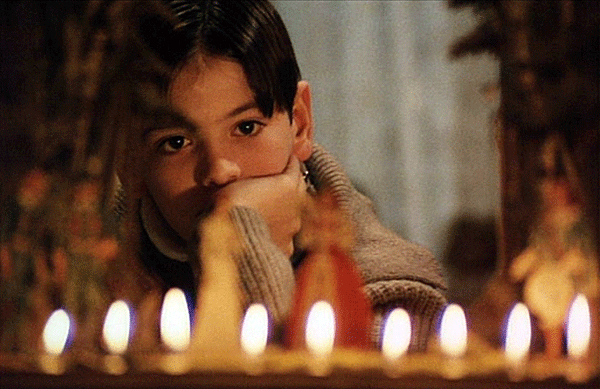 Here’s my suggestion for a great Christmas movie: Fannie and Alexander, directed by Ingmar Bergman. This movie is over three hours long (that’s the theatrical cut, it was also a television miniseries) so I’ve never been able to show it in a class. It is listed on Hulu as a “Family Drama,” but that is ambiguous — this is a movie about drama in families, but it is not a movie for children. In fact the movie probably has more impact for middle-aged audiences. Here are some things to watch for: Be prepared for a slow pace — just go with it and the payoffs in the Third Act will be worth it. Watch the way Bergman plays with his World; he really toys with your brain in a way that you don’t even know what he’s doing to you. An apparent late introduction of the Antagonist that still works (how does he do it?) Polarities pushed to incredible extremes. One of the most evil villains you will ever see, but without a shred of stereotype or cliché in the character. And the greatest Christmas celebration ever placed on celluloid — it will redefine the holiday for you. Here’s a hint: The movie makes more sense if you are at least a little familiar with Hamlet. More than a few people have been posting about the shocking statements from Steven Speilberg and George Lucas prophesying the “implosion” of the film industry. Add to that the recent book by producer/executive extraordinaire Lynda Obst that describes how even industry heavy-hitters are having trouble getting movies made, then top it off with the box office reports on the latest mega-movies, and you can almost start to feel sorry for poor little Hollywood. A few thoughts. First, this is not the first time the imminent death of Hollywood has been in the headlines. In 1952 the advent of television was similarly expected to be the doom of the big screen. It turned out instead to be a new way of selling movies. The same was true of videotape in the eighties and DVD in the nineties. Each of these was predicted to be the death knell of the movie industry and quickly became the new foundation of the industry instead. Secondly, a genuine cataclysm that could destroy the industry as we know it is actually possible. For a lesson on what Spielberg might be talking about when he says “implosion” you can read in Final Cut: Art, Money and Ego in the making of HEAVEN’S Gate how United Artists died. The studio founded by Charlie Chaplin, Douglas Fairbanks and Mary Pickford, was destroyed by a single movie in 1980. So it could have happened before and didn’t, but something similar also did happen before and could again. The threat is real. Anyone familiar with the movies Sunset Boulevard and The Artist can see how failure to adapt to new technology and market forces can leave filmmakers in the dust. Those who failed to adapt to audio in film were left behind. The contemporary situation is not exactly analogous — the threat of Netflix to mega-plexes is not the same as the threat of talkies to silent pictures — but it’s similar enough to make you stop and think about those movie makers who refused to allow microphones on the set and were never heard from again. First, we can be sure that we DON’T know how movies will be produced and consumed in the future. No one can tell you with certainty what new technologies and market forces will emerge in the next few years to alter the way people make movies and watch them. In the mid-eighties, when I was an undergrad studying mass communication, we had a class where we studied all the emerging technologies. Each student in a class of about thirty took a technology and did an in-depth analysis of its potential to change the communications industry. We discussed technologies like CDs, flat-screen, and high-definition TV, all of which were just emerging at the time. And here’s what we didn’t discuss — what none of us in 1985 saw coming: the Internet, email, cell phones (much less mobile computer smart phones), low-cost high definition cameras, non-linear editing systems, and tablet computers. In other words, important stuff that completely changed the world. Google didn’t exist and Mark Zuckerberg was in diapers. I suspect we’re in a similar place now. We have no idea what technologies, companies and market forces will shape the industry next year, much less in the next decade. We DO know that Hollywood has been faced with extinction before, but has adapted and actually grown as a result of forces that were expected to destroy it. I suspect that storytellers with nimble minds will find ways to adapt and thrive in the new realities. Because another thing we DO know is that human beings are storytelling animals. Stories are not a luxury; they are a necessity of life. A society can no more live without stories than a person can live without sleep. So no matter what form the market and techno-landscape take, we’re still going need skilled storytellers and their stories. We also know that different communication technologies communicate with the human mind in different ways and require different techniques. So as the technological landscape for storytelling shifts (say, perhaps in the direction of viewing on mobile devices instead of big screens or TVs) the storytellers who succeed will be those who master not just the new technologies, but find storytelling techniques that are uniquely suited to those technologies. We know as well that new communication technologies are almost always dominated by the thinking and techniques of the preceding technologies. In the past it has taken up to a full generation before storytelling techniques caught up with technology, as in the case of film itself, sound, color, zoom lenses, CGI, and 3D (which we still haven’t figured out completely.) All of these took decades to master to the point where they no longer called attention to their technological specialness and simply served the story they were telling. In the interim, new technologies tend to serve as new vessels to carry the old wine of the old storytelling technologies. But those who see the new technologies as nothing more than ways to repackage and get new revenue streams from the old techniques tend to be the ones who invest their psychic energy and their money in massive flops. This is where the potential for “implosion” is very real. Another thing we know well is that even as changes in storytelling technologies have mandated adjustments in storytelling techniques, certain basic concepts of how stories work have not changed significantly since the Greeks first wrote them down millennia ago. The medium that carries the story may metamorphose, but the target at which the story aims — the human soul — is still the same as it was in the days of Socrates. What we know finally, is that those who will succeed as storytellers in the new paradigm, whatever it may be, will be those who can simultaneously embrace and master the new technologies and stay firmly grounded in the storytelling basics that are as powerful today as they always were. This article on the effect of movies on the brain was written for an audience of scientists, but it has some interesting points for those of us in the media. I have long believed, and have taught in my classes on Film Analysis, that many of the techniques filmmakers use to guide an audience through an experience (what we call telling a story) have a foundation in neurology. Now we have scientists performing experiments with sophisticated instrumentation to find empirical data in an attempt to prove whether and to what extent that is true. Ultimately, the article is frustrating because it offers a tantalizing tidbit and ultimately raises far more questions than it answers. And that’s certainly not a criticism; the authors themselves acknowledge they are just scratching the surface of understanding how films make an impact neurologically and there is much more to learn. How does “persistence of vision” work where, in a movie projected from film the screen is actually flashing dark in between frames, but the perception from the viewer is uninterrupted motion? Is there a difference between the way the brain perceives progressive scan video (i.e. 24p) as opposed to interlaced video? A lot of people say progressive scan video is more “filmlike”; can instruments detect brain activity that would explain this perception? How does the brain perceive video compared with projected celluloid? I theorize (based on hints from Frank Daniel) that a gradual introduction of a character or other key cinematic element arouses curiosity, thereby activating the creative areas of the brain and effectively shutting down critical and logical brain functions, which allows for “suspension of disbelief” and a cinematic experience that has much in common with dreaming. Can brain science either confirm or disprove my theory? Frank Daniel theorized (and I have adopted his theory) that film creates stronger emotional and physical identification with characters and is more highly vicarious in the way audiences experience emotional and physical aspects of the lives of the characters than literature. Can brain science shed light on this? Frank theorized that in a well told story audiences progress from curiosity to sympathy to eventual empathy for the characters. Can brain scientists prove whether he was right? I argue in my upcoming book series Good Stories Well Told that professional critics — that is people who go to the movies and evaluate them for a living — are neurologically incapable (or at least disadvantaged) when it comes to experiencing a movie in the same way an audience does when they go to the movie as a means of escaping from their every-day lives. Am I wrong? I could go on. The idea of getting real empirical information on how media has in impact on the brain is very exciting — and maybe a little dangerous. Whenever people start to get the idea that they can engineer communication, the result is usually not pretty. When Gutenberg printed his first Bible with moveable type, he took great pains to make it look as though it had been copied by hand. The makers of the first dramatic movies tried hard to make their work as much like stage plays and novels as possible. The early talkies were wall-to-wall dialog and orchestra because, well, there was sound. When color started to appear regularly in films, the screen was a riot of hyper-saturated hues, as if to make sure you wouldn’t forget you were watching a movie in color! When post production people started to use computer graphics for special effects, we suddenly found ourselves watching movies that were more about CGI than characters. In each one of these cases, new communication technology was defined by the preceding technology, either by trying to reproduce the earlier form, or to make sure people were aware that you were using the latest technology. As a result, the stories tended to take a back seat to the machines. It took about a decade before storytellers learned how to use the technologies as effective storytelling devices without the need to demonstrate the technology itself. In other words, it took time learn to use technology in ways that no one was aware the machines were even there because the story had all their. Where are we with ebooks? Well, if they were movies, 2012 would be about 1904. In other words, we have not yet seen the definitive ebook. By that I mean a self-contained digital communication that provides a satisfying artistic experience that is a result of inherent properties of the digital technologies used to create it. It isn’t an electronic “version” of anything else. It doesn’t derive its power from recalling to mind another medium. What we have at this point appears to be one of two things: First we have a lot of books preoccupied with reproducing the preceding medium, i.e. ebooks that try as hard a possible to be like paper books in the same way early movies tried to reproduce stage plays on the screen. The second is ebooks (or some variant thereof) that are electronic gimmicks, gadgets and novelties that feel more like parlor tricks than the experience of a great novel or movie. Where is the Melias, the Griffith, the Eisenstein of ebooks? Where is the ebook equivalent of The Great Train Robbery, the movie that defined storytelling in feature films? The question is not rhetorical: if you know of an ebook that speaks powerfully and clearly because of — not in spite of — the attributes inherent in its electronic format, please share it and let us start to build on it.